A training programme on “Freshwater aquaculture as a livelihood option for tribal youth of Assam” has been started at ICAR- Central Institute of Freshwater Aquaculture, Kausalyaganga, Bhubaneswar, Odisha from 13 January till 16 January, 2016. The programme is sponsored by 21 Battalion, the Mahar Regiment, Indian Army. In this programme 20 tribal youths from frontier areas are getting trained in new techniques of freshwater aquaculture practices. The inaugural function of the programme was held on 13 January, 2016 at ICAR-CIFA Conference Hall. Dr. P. Jayasankar, Director, ICAR-CIFA, Kausalyaganga was the Chief Guest of the function and inaugurated the programme in the presence of the guests and participants. He highlighted the role of ICAR-CIFA for research in frontier areas of the freshwater aquaculture and dissemination of the technology to the farming community. He encouraged the participants to get as much knowledge about fish culture from ICAR-CIFA. Dr. B.C. Mohapatra, Principal Scientist, Chairman, Tribal Sub Plan and Course Director of the programme welcomed the participants and guests to the programme. He informed the gathering regarding the role of ICAR-CIFA for dissemination of aquaculture technologies to the tribal community of India through TSP. Heads of the Divisions, Scientists, Technical Officers of ICAR-CIFA and KVK (Khorda); and members of 21 Battalion, The Mahar Regiment, Indian Army were present in the occasion. 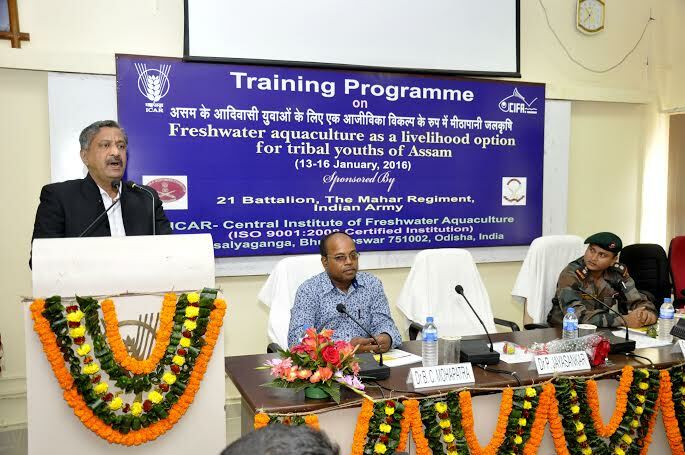 Captain Asish Srivastav of the 21 Battalion, Mahar Regiment of Indian Army, Assam thanked ICAR-CIFA for giving training to the tribal youths of Assam consecutively for last two years. These trainings are sponsored by the Indian Army for socio-economic development of youths of frontier areas of Assam. Mr. N.K. Barik, Scientist (SS) gave the vote of thanks. The programme was coordinated by Mr. K. Anantharaja, Scientist and Dr (Mrs.) U.L. Mohanty, Sr. Technical Officer of ICAR-CIFA. ICAR-CIFA is the premiere freshwater fisheries research institute of the country and has invented many innovative technologies since its inception and contributed immensely towards the blue revolution in the country. Under the Government of India Tribal Sub-plan Programme (TSP), the tribal farmers of the country are given demonstrations in their localities and imparted with training on different scientific aquaculture methods like fish breeding and hatchery operation, nursery rearing, grow out culture and integrated fish farming, etc. Presently the TSP activities of the institutes are going on in West Bengal, Odisha, Gujarat, Kerala and other states of North East.